#Bookreview PRACTICING NORMAL by Cara Sue Achterberg (@CaraAchterberg) A great book about the games families play and what love really is. The houses in Pine Estates are beautiful McMansions filled with high-achieving parents, children on the fast track to top colleges, all of the comforts of modern living, and the best security systems money can buy. Welcome to normal upper-middle-class suburbia. The Turners know in their hearts that they’re anything but normal. Jenna is a high-schooler dressed in black who is fascinated with breaking into her neighbors’ homes, security systems be damned. Everett genuinely believes he loves his wife . . . he just loves having a continuing stream of mistresses more. JT is a genius kid with Asperger’s who moves from one obsession to the next. And Kate tries to manage her family, manage her mother (who lives down the street), and avoid wondering why her life is passing her by. And now everything is changing for them. Jenna suddenly finds herself in a boy-next-door romance she never could have predicted. Everett’s secrets are beginning to unravel on him. JT is getting his first taste of success at navigating the world. And Kate is facing truths about her husband, her mother, and her father that she might have preferred not to face. Life on Pine Road has never been more challenging for the Turners. That’s what happens when you’re practicing normal. Combining her trademark combination of wit, insight, and tremendous empathy for her characters, Cara Sue Achterberg has written a novel that is at once familiar and startlingly fresh. I was given a copy of this book as a gift and I freely chose to review it. Tolstoi’s probably best-known quote: All happy families resemble one another, each unhappy family is unhappy in its own way fits perfectly this novel. As a psychiatrist, ‘normal’ is one of those terms that we always seem to come back to, even if it is impossible to define. It seems that normal is always what other people are, never us. Perhaps, as it is discussed in the novel in reference to Autism and Asperger’s, which are conditions that fall within a spectrum, the same is true for normality. It is not an on or off thing. Perhaps we all belong to some point within the spectrum, but we’d be hard pushed to find many people whom we’d all agree were ‘normal’, at least if we got to know them well. The novel introduces us to the Turners, who live a reasonably comfortable life within a theoretically idyllic neighbourhood. Once we scratch a bit under the surface, we find: Jenna, the sixteen year old daughter, who is not a goth but likes to shave her hair, dye it in interesting colours, collects piercings and is an ace at breaking into neighbours’ houses (courtesy of her father’s job in a security company). Kate, her mother, is forever busy caring for everybody but herself. She has to look after her mother, Mildred, who might be dementing, or perhaps not, and who lives alone, never leaves the house and talks to her birds. She also has to look after JT, her son, with an Asperger’s diagnosis, who cycles through periods of obsession with different topics (ER Medicine, Fire-fighting…), has tantrums if his routine is disturbed, cannot read people’s expressions or understand their feelings, but is a genius at Maths and has an incredible memory. She also runs around the rest of the household and is always worried about her husband, Everett, who cheated on her once (that she knows of). The chapters alternate the first-person narrations of Jenna (who somehow becomes friendly with the rich, handsome and all-around nice neighbour, Wells, who isn’t, after all, the stereotypical jock), and Kate (whose sister, Evelyn, has made contact with their father, Frank, who left them when they were young children, and believes their mother has been lying to them) allowing the reader to better grasp, not only the secrets they all keep from each other, but also the different ways the same events can be interpreted and seen. Everett’s narration (also in the first person) joins later, giving us hints of more secrets to come, allowing us a more rounded picture and offering us a male perspective. I found the first person narrations served well the topic, and the voices of the three narrators were very distinct and fitted in well with their characters. Although personally, I can’t say I liked Everett very much, no characters are despicable and all of them love their family and each other, even if they might go about it the wrong way. Jenna’s strong hostility towards her father is easy to understand, not only because he cheated on her mother (and is still doing it after promising not to) but because she had idealised him when she was a child and he’s shattered that illusion. She is clever, challenging and reckless but with a great heart (she doesn’t care for rules or conventions but has no bad intentions) and her romance will bring warm memories to all readers who are still young at heart. Kate is a woman who is always at the service of others and makes big efforts to ignore what she feels she can’t cope with, even if it means living a lie. But she learns that she is stronger than she thinks and grows during the novel. She also gets to understand that her dreams of romantic love are unrealistic, and we feel optimistic for her at the end. Everett is a man who lost his way (it seems) when he left his job as a policeman. Now, to feel better about himself he’ll do almost anything, not caring what the consequences for himself and others might be, and he always puts his needs before those of the rest of his family. He does not understand his children but he loves them and tries to do what he thinks is best, within limits. JT is a wonderful character, well-drawn and realistic in terms of the behaviours he exhibits and his relationship with Kate, Jenna and the rest of the family is heart-warming and has the ring of truth. There are many secrets, some that come from a long time back and some much more recent, and the narrative is good at revealing them slowly, even if we might strongly suspect some of them, partly because we have access to the thoughts of several the characters (as they don’t communicate with each other that well). There are also many love stories and many different kinds of love that are explored. Ultimately, love must be about more than just saying the words and looking into each other’s eyes. It isn’t something we should feel automatically entitled to; it has to be proven and worked on, as Cassey, a friend of Jenna and later Kate, explains. The secondary characters are also interesting, mostly sympathetic (with the exception of Wells’s family, and Evelyn, who comes across as self-centered and domineering) but not drawn in as much psychological detail as the members of the family, but they are far from unidimensional. I really liked Cassey, the hospice nurse who understands all the females of the family and helps them without asking anything in return, and Phil, a good man who, like Wells, disproves Mildred’s generalisations about men. Mildred, the grandmother, can be at once annoying and endearing, but eventually, we get to understand her a bit better, even if we might not necessarily agree with her actions. I also loved the animals, especially Marco. This is a well-written book, where plot and characterisation go hand in hand, that offers good psychological insights into the nature of family relationships and the games members of a family play with each other. It also will make readers think about what love means and will remind them of the risks of keeping secrets, not only from others but also from ourselves. The narration flows well and once you get to know the characters it’s difficult to stop reading and you feel bereft when you come to the end as they’ve become part of the family. A great read. I couldn’t leave you without sharing a few of the sentences I highlighted. Never break more than one law at a time. Kate talking about JT, her son, with Asperger’s: but I focus on what JT can do, not what he can’t. Maybe it would be easier to sail through life unaware of the emotions of the people around you. If men didn’t have penises, they’d probably be a lot smarter. Thanks to all and remember to like, share, comment, click and to review all the books you read! Previous Post@FTThum #BookReview ‘The Scent of You’ by Maggie AldersonNext PostBook Reviewers Wanted!! I was at a lecture last week. There was an empty seat between me and a woman on my right. For some reason, she had one arm stretched out across the empty seat and kept flicking her finger on the plastic seat. I heard it, of course, it was right next to me. I didn’t say anything, but the woman siting behind us did. She had no problem telling that woman the noise she was making was distracting. Don’t worry. I know what you mean about late night (or early morning). I hope tomorrow is good. 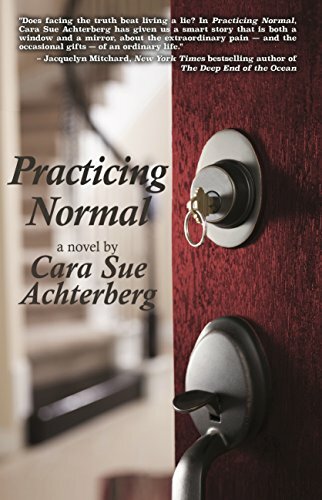 Check out this review of the book, Practicing Normal, by Cara Sue Achterberg, from the Lit World Interviews blog.